LONDON: 20 APRIL 2016 - The directors of ECR Minerals plc (the “Directors”) are pleased to announce the publication of the JORC Code-compliant technical report which has been prepared by Snowden Mining Industry Consultants in relation to the Avoca and Bailieston gold projects in Victoria, Australia (the “Report”). The Company’s wholly owned Australian subsidiary Mercator Gold Australia Pty Ltd (“MGA”) has entered into an agreement with Currawong Resources Pty Ltd (“Currawong”) for the acquisition by MGA of 100% ownership of the Avoca and Bailieston projects. Further details regarding the acquisition are available in ECR’s announcement dated 3 March 2016. The acquisition remains conditional on the necessary Victorian government authorisations and registration of the transfer of the projects to MGA. Issuance of the Initial Consideration Shares, as defined in the 3 March 2016 announcement, to Currawong has been delayed at Currawong’s request while arrangements are made for delivery of the shares. 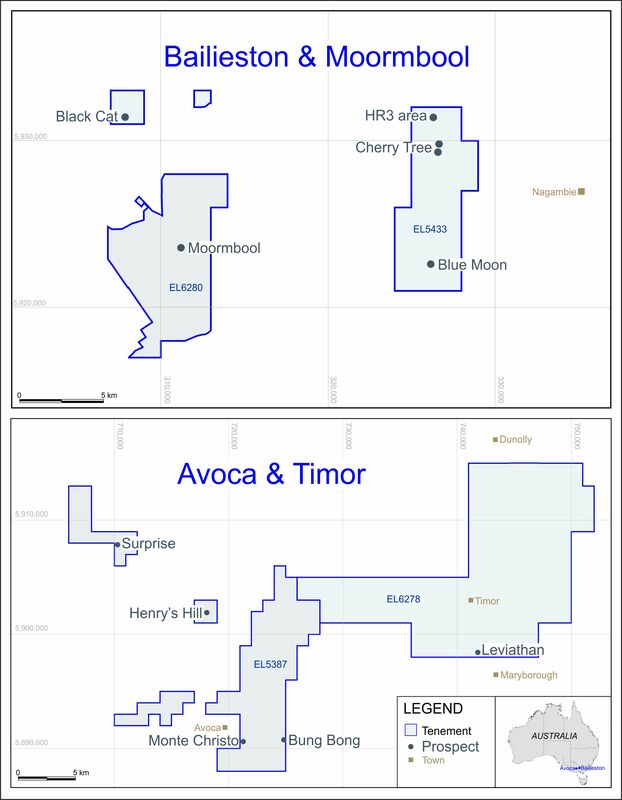 “In accordance with the recommendations of the Report, the Directors intend that MGA will continue to develop and implement a measured and carefully controlled exploration strategy for the Avoca and Bailieston projects, while prioritising the generation of short term cash flow from the proposed reprocessing of historical mine dumps at the Avoca project to produce gold, with saleable gravel and sand as by-products. The Directors are optimistic regarding MGA’s ability to progress in this manner, particularly in view of Victoria’s status as a mining friendly jurisdiction with a rich history of gold mining, and which does not levy a government royalty on gold production. In addition, the proposed reprocessing operations would be expected to benefit from MGA’s substantial tax losses, which may be available, subject to certain conditions, to reduce MGA’s future taxable profits. This Competent Person’s Report describes the mineral exploration assets of Currawong Resources Pty Ltd (Currawong), a wholly owned subsidiary of Flitegold Pty Ltd (Flitegold), an Australian private company. Mercator Gold Australia (MGA), a wholly-owned Australian subsidiary of ECR Minerals plc (ECR), of London, has agreed to purchase 100% of these assets and has entered into a Deed of Assignment and Assumption with Currawong. The assets are located in the Central Goldfields region of the Australian state of Victoria. MGA is assuming operating rights over the assets from Currawong. Currawong’s assets are exploration projects and do not contain any identified Ore Reserves or Mineral Resources, as defined by the JORC Code. Victoria is one of the world’s major gold provinces. Total recorded gold production, from 1851 to June 1998 is about 2,500 tonnes (80.4 million ounces (Moz)). Total Victorian gold production represents 32% of all the gold mined in Australia and 2% of all the gold mined in the world. The Victorian alluvial gold production from 1851 to present is approximately 710 tonnes (22.8 Moz), making it possibly the largest alluvial gold province in the world. Currawong’s assets are in cratonised granite/volcanic Victorian fold orogenies. Each location has significant potential for gold mineralisation. The assets consist of two projects, Avoca and Bailieston, both within the major orogenic Lachlan Fold Belt. The Lachlan Fold Belt is subdivided into zones, based on distinct geological and metallurgical characteristics, with the Avoca project lying to the west, within the major gold producing zone, the Stawell Zone and the Bailieston project lying within the Melbourne Zone, to the east. The Stawell Zone Avoca project consists of a flysch of intensely folded Cambrian turbidites, altered to greenschist facies slate and greywacke. Granite intrusives provide the regional fluid and structural control. Mineralisation is hosted by quartz-filled brittle/ductile fault structures and is characterised by gold with base metal sulphides. The Avoca area has a significant production history of alluvial gold from Tertiary river beds and “deep leads”, which represent palaeochannels that have been buried by basalt lava flows or fluvial terraces. The gold in these locations is trapped by undulations on the basement rock and follows the sinuous course of these palaeochannels. The Melbourne Zone Bailieston project consists of Siluro-Devonian sediments intruded by Devonian granite stocks. Mineralisation is hosted by vein or stockwork structures, typically within anticlinal trap structures within the sediments. The Bailieston area has a modest historical production history from alluvial and vein quartz mines. It has a more recent history of exploitation of low-grade, bulk mining stockwork or layered vein structures such as the Bailieston open cut mine which was operated by Perseverance Corporation Ltd (Perseverance) in the 1990s. Other modern nearby open cut gold operations which operated include Hill 158 at Nagambie, Red Hill at Heathcote and the various pits at Fosterville and Costerfield. These latter two continue to operate as higher-grade underground mining operations and Fosterville has recently produced its one millionth ounce. MGA proposes to explore the tenements using conventional geophysical, geochemical and mapping techniques, utilising appropriate local contractors under the supervision of MGA officers. Preliminary target identification may be followed by conventional drilling, to be undertaken in accordance with an appropriate reporting code. 1) Remnant gold contained in mine dumps at Avoca and other places. A second source of potential revenue is construction materials sourced from the dumps, for which Currawong has conducted preliminary investigations. 2) Quartz vein hosted gold and related placer-style “deep lead” mineralisation at Avoca. This concept is premised on the considerable mining history of such deposits at Avoca and a significant historically identified potential gold accumulation within buried river channels, derived from drilling conducted in the 1930s. 3) Epithermal “Carlin” style disseminated or sheeted vein hosted gold mineralisation at Bailieston. This concept is premised on the presence of such a deposit that was recently exploited at Perseverance’s Bailieston mine, immediately north of the tenement and considerable evidence that the structure that hosts this deposit is repeated within the Bailieston project area. MGA seeks to establish short-term cash flow through retreatment for gold of historic mine dumps at Avoca, with opportunities for sale of by-products as construction material, in order to provide funding for progress on longer-term opportunities. In this regard Snowden has conjecturally derived Exploration Targets, as defined by the JORC Code, for each project area, based on the relevant geology and the proximity and tenor of nearby known mineralisation (Table 1.1). Snowden cautions that these Exploration Targets are conjectural and speculative only and serve to indicate the scale of potential mineralisation within the project areas, based on current geological understanding. These Exploration Targets do not imply economic viability. The information in this report that relates to Exploration Targets is based on information compiled by Mr Jeremy Peters, a Competent Person who is a Fellow of The Australasian Institute of Mining and Metallurgy and Chartered Professional Mining Engineer and Geologist of that organisation. Snowden considers the Currawong assets to be at a basic level of exploration, with no identified Mineral Resources, as defined by the JORC Code. The assets enjoy ease of access and the presence of significant infrastructure. MGA proposes to manage the projects through the engagement of suitable local contractors and consultants, under the direct supervision of MGA. Snowden identifies MGA’s interests as comprising a Deed of Assignment and Assumption of 100% ownership of two Exploration Licences in Australia (Table 1.2). Snowden concludes that MGA has rights to acquire prospective exploration tenements and projects in Australia and that these tenements are prospective for gold. Snowden considers the projects to be at an early stage of exploration and that their prospectivity is identified through the geology of the projects themselves, indicative exploration results from previous explorers, and the presence of significant mineralisation that has been commercially exploited historically or currently within the tenement areas themselves or on adjacent properties. MGA’s strategy is focused on identifying mineralisation that can be economically exploited in the short term, to provide funding for progress on longer-term opportunities. Snowden notes the presence of suitable infrastructure that could be made available, by arrangement, to advance these short-term projects. Snowden recommends that MGA continue to develop a coherent exploration strategy with the aim of generating short-term cash flow from the assets. Snowden further considers that the re-processing for gold of historic mine dumps at Avoca presents an obvious source of short-term cash flow and recommends that MGA devote appropriate resources to obtaining the necessary licences and metallurgical testwork to progress this. Snowden recommends that any exploration activities undertaken by MGA be carried out in accordance with an appropriate reporting code, the JORC Code seeming the most applicable. The JORC Code defines an Exploration Target as being a statement of the exploration potential of a mineral deposit in a defined geological setting, quoted as a range of tonnes and a range of grade for which there has been insufficient exploration to estimate a Mineral Resource. Such a target does not in any way constitute a Resource Estimate, as defined by the JORC Code and is entirely conceptual in nature. Snowden presents its Exploration Targets for Currawong’s projects along with commentary on activities and timeframes to realise this potential (refer to Section 14 below). MGA targets both alluvial mineralisation and Early Devonian mesothermal quartz-gold vein deposits and identifies opportunities for short-term historic mine dump retreatment for gold (Table 13.1), with associated industrial mineral production as a by-product. Snowden considers that there is geological and historical evidence to support this view. Mesothermal veins are typical of Victoria and vary widely in style and metallogenesis (Figure 13.4). Quartz veins may extend for several kilometres but are economically mineralised at discrete intervals, termed “shoots”. These veins are found throughout the western part of Central Victoria, from the Moyston Fault to the Mt William Fault, known as the Stawell and Bendigo zones (Figure 8.2 and Figure 8.4). They represent deeper mineralisation than the Middle Devonian (380 Ma) epizonal mineralisation, found largely east of the Mt William Fault (the Melbourne Zone, refer Section 8.1 above), with the exception of the Fosterville mine, amongst others. Victorian mesothermal gold mineralisation is confined to vein selvedge contacts as a result of the formation depth and physico-chemical constraints. Gold precipitation often occurs as coarse grains or nuggets, which are formed where the host rock has a reducing chemical nature, such as carbon rich slates, causing the gold to precipitate en masse. • Recent enquiries by Currawong of nearby concrete producers indicate a market for sand and gravel for building and construction purposes, particularly in the city of Ballarat, about 60 km from Avoca. Currawong’s 2015 statutory Annual Report to the GSV describes a resource estimation exercise undertaken in 2014/2015 on the five dumps present at Homebush. Surface auger drilling was carried out and a database created. An electronic wireframe was developed for each deposit, based on the drilling and extended to mapped dump extents. These wireframes were then used to create a block model and a resource estimate was generated for both the uncut and top-cut gold assays. Snowden does not consider that the result of this exercise (Table 13.2) comprises a Mineral Resource estimate that in any way complies with the guidelines of the JORC Code, but it does provide basis for the generation of an Exploration Target. Snowden considers that Currawong’s results support an Exploration Target of between 200,000 and 250,000 BCM of treatable material at a grade of between 0.5 g/m3 and 1.5 g/m3 (Table 13.1). Further work is required in relation to bulk sampling to inform a Resource estimate. Snowden considers that an appropriate means of informing a Resource estimate would be to process a suitable number of samples of known volume through a gravity test plant and derive grades expressed in grams per cubic metre, as is the practice with alluvial deposits. Consideration should be given to the use of a “Ditch Witch” excavator to sample the dumps in a controlled manner, cutting sections through the dumps at appropriate intervals. Snowden recommends that the dump volume be professionally surveyed. MGA proposes to assess these waste dumps with physical and chemical tests to determine suitability for industrial use and/or gold production. Currawong has previously investigated a simple washing plant, with a possible cyanide section to treat fine material, appropriate to produce the various sized by-products and gold (refer Section 15 below). Historical alluvial gold production at Avoca is reportedly in the order of 740,000 ounces and the Avoca Lead has contributed a large portion of this production. MGA considers that for an area that has had such extensive alluvial gold production and relatively little drilling, further exploration is appropriate. At the Working Miners Group, three neighbouring mines produced 102,000 ounces from the Homebush Lead. The Homebush Lead was targeted further downstream by two companies who both failed to sink a production shaft to target depth, following extensive drilling. Historical drilling identified a large gold structural “trap” or sump, where several buried gullies flow into a local basement depression or ancient lake (refer Section 8.3 above). Currawong considers that this ancient lake has a potential area of 500 ha. Snowden considers that there is geological and historical evidence to support this view, but cautions that it can be difficult to define Mineral Resources and Ore Reserves of this nature under the JORC Code. Gutter gradient or slope is a key factor in collection of alluvial gold. Steeper sloped gutters have historically returned better gold grades because of the natural concentrating process and MGA considers that targeting of steeper gutters is attractive (Figure 13.1). Gradients are established by drilling as well as geophysical techniques such as seismic, GPR and resistivity. Currawong has devised an exploration strategy such that a combination of GPR or shallow three-dimensional (3D) seismic geophysics will identify alluvial gutters and large diameter percussion/aircore drilling is expected to establish the location of potentially economic gold deposits. Previous, untargeted probe drilling has traversed the valleys searching for gutters or leads and much effort has been expended in identifying the location of the gutter rather than sampling the gutter itself. • Steeper basement floor gradients return better gold grades than flatter sections. • Narrow and more defined gutters return better gold grades than broad and flat basement zones. • Modelling of the buried basement topography by geophysical techniques, such as GPR and shallow seismic refraction profiling, in 3D or 2D, results in adequate target definition for drilling. An example of a GPR traverse section generated by explorers elsewhere is presented in Figure 13.2. • Strip mining is more expensive than dredging, but is more selective, being visual and specifically targets the ore zone. Strip mining processes only that which is determined to be ore.
• Dredging processes all of the material mined, facilitated by pre-stripping overburden and is therefore better suited to thicker sequences of auriferous gravels. Dredging mines blind and there is potential to lose mineralisation at the bedrock interface if the bedrock is undulating or jagged. Currawong considers that each technique has a potential application at Avoca, subject to the successful implementation of the exploration strategy devised by Currawong. Snowden concurs with this view. 1930s bucket-wheel dredges were prone to mechanical breakdown and high maintenance. Modern dredges are of a suction or cutter suction type, which have less moving parts and rely on large pumps to mobilise sand and gravel into the floating plant. Suction dredge sand mining is applied to mineral sand mines in Victoria (Figure 13.3) and is a known technology. In Figure 13.3, the mine is operating to the left and waste material is placed to the right, with mining progressing to the left. The suction dredge is floating on the far left, and this pumps ore slurry to a trailing barge for separation. Progressive rehabilitation can be seen in the right of Figure 13.3. Avoca primary mineralisation is associated with large and medium scale faults which have been mineralised by Early Devonian quartz-carbonate-gold veins (Figure 13.4, “Redbank” mineralisation) proximal to the north striking Avoca Fault (refer Section 8.1 above). At Percydale, immediately west of the tenement, the quartz veins are moderately rich in pyrite-pyrrhotite-galena-chalcopyrite and sphalerite and Currawong observes that gold grades generally improve with sulphide content. Currawong considers that this is applicable to EL5387 and provides a geochemical means of target definition. Later granite intrusives introduced base metals such as bismuth, tellurium and tungsten and overprints the earlier gold mineralisation. Currawong considers that polymetallic type deposits generated in this way represent further potential for exploration, such as those historically identified within EL5387 at Surprise and Henry’s Hill. Currawong identifies more than 20 hard rock gold-quartz prospects within EL5387, none of which (except Surprise, refer Section 10.1 above) have been drilled. Many of the quartz veins show lengths greater than 1,000 m as well as widths of 2 m to 10 m. MGA proposes to target these types of deposits as open pit or high grade underground projects. Snowden concurs with this view. Currawong has targeted epizonal or epithermal gold mineralisation of the Melbourne Zone (Table 13.3). This forms at lower confining lithostatic pressures and allows brecciation of the host rock and better permeation of the gold rich hydrothermal fluids into the host. Snowden concurs with this view. The same lithological-structural characteristics apply as for the flysch type host rocks, but at a lower greenschist or prehnite-pumpellyite metamorphic grade, which has allowed the sandstones to remain more permeable. When mineralised, the sandstones form silica saturated quartzites and often have disseminated auriferous pyrite. Silicate alteration assemblages are more widely spread around the quartz veins, in the form of muscovite(sericite)-chlorite-ankerite/dolomite, while sulphide vein assemblages are pyrite-arsenopyrite-stibnite. Gold mineralisation zones may be quartz vein poor and may occur solely as silicification, sericitisation and disseminated pyrite. This mineral assemblage and metallogenesis is similar to the “Carlin style” large scale gold deposits of Nevada, USA and can be subtle and overlooked in the field. Past explorers were not searching for these types of low grade large scale deposits. MGA considers this to be an attractive, high priority Exploration Target. Snowden concurs with this view. Fine grained disseminated gold has been recently mined in Victoria from silicified and quartz veined sediments. Currawong considers that this mineralisation is geologically similar to the economically significant “Carlin style” of epithermal gold mineralisation, in Nevada, USA. These modern Central Victorian open cut mines utilised heap leach techniques to process oxide ore and include Fosterville, Heathcote, Costerfield (part of the Redcastle structural corridor), Nagambie and Bailieston, immediately north of EL5433 (Figure 8.6). These structures are considered to be mineralised by the same underlying Strathbogie Mid-Devonian granitic intrusive complex (Figure 13.5). The Fosterville mine has continued its operations underground, processing sulphide ore with a flotation bacterial oxidation cyanide-in-pulp (CIP) plant. On 2 February 2016, Newmarket Gold announced that Fosterville has produced 1 Moz over 11 years’ continuous operation. Newmarket reported hard rock Mineral Resources of 2.1 Moz (as at 31 December 2015). Fosterville is located in the Ordovician Bendigo Zone, but the mineralisation has been established to be part of the dominant epithermal regime of the Melbourne Zone that overlaps the Bendigo Zone (refer Section 8.1 above). EL5433 lies within the Melbourne Zone (refer Section 8.1) and Currawong considers that the gold-arsenopyrite-stibnite mineral occurrences are similar structurally and geologically to the Fosterville setting. The subtle but recognisable alteration presents an opportunity to identify similar deposits through structure, geochemistry and alteration mapping. MGA’s strategy is to rank the projects according to the likelihood of preliminary cash flow and initially focus its resources on these areas, while simultaneously progressing those areas that present more substantial targets at an appropriate pace. MGA proposes that resource definition at Avoca’s Homebush dumps be the first priority, with Avoca preliminary regional surveys to be concluded thereafter. Trenching or drilling of some prospects at Avoca (No. 2 Creek), Bailieston (HR3 and Black Cat) is contemplated and further prospect assessment and target generation will occur, with numerous prospects to be assessed, some of which have been discussed in this report. The Homebush resource estimation will require metallurgical, engineering and market studies to support a feasibility study. MGA proposes that these be handled by a local mining engineering consultancy. Snowden endorses this approach. MGA proposes to examine the Homebush dumps as a remnant gold extraction project, with potential for commercial sale of gravel and sand by-products. Currawong has undertaken a preliminary examination of this concept and considers that it offers potential low capital cost and rapid development. Besides the Homebush dumps, MGA considers that the No. 2 Creek alluvial gold deposit presents the most immediate gold target. Currawong has contemplated drilling this using the ODEX drilling system, which is considered appropriate to return a sample of suitable volume for testing. Snowden endorses this approach and recommends a concurrent prospect-scale geochemical assessment of the various hard rock targets. Follow-up sampling may occur to further refine the results of the first phase, with prospects that return positive results then being ready for preliminary drilling. MGA proposes to initially examine the Byron and Black Cat prospects for potential as open cut gold operations. These projects have returned positive results to date and the Byron-Maori structures contain identified high grade gold mineralisation which requires definition through drilling. MGA considers that these prospects offer potential low capital cost development through utilisation of existing contract mining and toll treatment facilities. MGA proposes to concurrently explore the Dan Genders and Cherry Tree areas. Success at these prospects may present a stand-alone mining and processing operation. Other known hard rock prospects will concurrently be geochemically and geologically mapped, particularly in the Cherry Tree Anticline/Fault corridor. Positive preliminary results may be followed up with scout drilling, particularly on strike to the Cherry Tree-Bailieston known workings. Currawong has conducted preliminary examinations of the Avoca historic mining dumps, to assess the economics of extracting remnant gold mineralisation and in developing an Exploration Target (refer Section 13.1 above). Currawong considers that the gravel and sand by-product of gold extraction represents a potential source of saleable construction material. Snowden considers that this examination approaches a “Scoping Study”, as defined by the JORC Code and indicates a positive economic return under the assumed conditions. Snowden cautions that the results of this study are preliminary only and do not present absolute economic viability or return. MGA proposes to initially examine the dumps present at Homebush group of mines where Currawong’s work indicates approximately 220,000 m3 of material (refer Section 13.1 above). The dumps include the Golden Lake, Working Miners, Working Miners United, Working Miners No. 2 and New North Homebush mines, all being less than 1 km apart. Preliminary sampling by Currawong indicates the presence of potentially economic gold and commercially saleable construction materials. Currawong conducted sieve tests on material from four separate dumps (Figure 15.1), weighing and assaying each size fraction. Dump volumes have been geometrically estimated from tape and compass survey and require formal survey, but Snowden considers the approach to be appropriate for a preliminary study. Snowden cautions that these tests are preliminary only and do not incorporate the considerations of the JORC Code, Table 1. The test results indicate the possible presence of economic material. Currawong has not yet performed gravity gold recovery tests and assumes a dry weight density of 1.5 t/m3. Currawong identifies in the order of 0.33 Mt of auriferous gravelly sand that its most recent work indicates to have an average grade of 0.28 g/t Au (Table 13.2). Currawong has previously performed sieve tests which indicate that an average of 45% of the sieved sand passes 600 µm. The silicon content of screened and washed >5 mm material was determined by total acid digest and the four gravelly sand dumps tested yielded silica assays of >98% SiO2. Currawong consequently considers that a screening plant will return a product that is suitable for commercial sale. Currawong has investigated establishing a mobile gravel washing and screening plant at the Homebush dump site, utilising water from existing mineshafts as process water. Such plants are manufactured in Australia and are readily available new or second-hand. Investigations indicate capital cost of between A$50,000 and A$200,000, depending on size and condition. Currawong has investigated the local gravel market and established a potentially significant requirement in the nearby city of Ballarat (refer Section 13.1 above) and considers that various sized screened products can be produced to satisfy market demands. Preliminary investigations indicate that sand suitable for concrete with sized gravel aggregate bring a premium to un-sized material. Currawong has provisionally assumed A$250,000 capital to establish a sand washing operation, including water supply and waste storage. Environmental considerations are at a conceptual stage, with recognition that slurry dams are required for waste storage and water recycling. Currawong has investigated CIP processing of auriferous fine material (<600 µm) and identified a commercially-produced, modular 25 tonnes per hour (t/hr) CIP plant. The specifications for this unit have been used in its examination of the project, with local suppliers of CIP equipment claiming construction of comparable plants for in the order of A$1 million. Manufacturer specifications of the modular plant indicate that 75,000 tonnes of <600 µm dump material could be processed in around six months, allowing a CIP residence time of 12 hours. Snowden cautions that no metallurgical recovery testwork has been undertaken to date and revenue from gold recovery has been excluded from the base case of the Currawong concept study, which considers sale of gravel products only. MGA will focus its initial efforts on modern and efficient gold gravity recovery techniques in preference to a commitment to more capital and operating cost intensive CIP techniques. Snowden supports this approach. 1) Professionally survey the dump volumes. 2) Bulk sample the dumps for gold recovery. Snowden’s experience with alluvial projects (which are broadly comparable to the dumps) has been to collect a suitable number of samples of known volume from regularly and appropriately spaced sections. Snowden recommends use of a “Ditch Witch” or small excavator. The number of samples taken is dependent on the variability identified in the dump, but various nomograms have been published that can assist in informing the initial sampling campaign. 3) Process the samples through a pilot gravity wet separation plant. Snowden’s experience with such plants has been with trailer-mounted units comprising a small grizzly feeding a trommel, two jigs and a small Knelsen concentrator, all in series (Figure 15.3). This arrangement is capable of collecting any commercially meaningful gold and is calibrated using lead shot. This plant is capable of commercial production. 4) The above sampling exercise is, in Snowden’s opinion, suitable for informing a Mineral Resource estimate, if performed in a disciplined manner. Snowden strongly recommends that any Mineral Resource be estimated by a suitably qualified specialist Resource Geologist and suitable parameters be identified to express the Mineral Resource as in-situ grams per cubic metre. Snowden concludes that MGA has agreed to acquire prospective exploration tenements and projects in Australia and that these tenements are prospective for gold. Snowden considers the projects to be at an early stage of exploration and that their prospectivity is identified through the geology of the projects themselves, indicative exploration results from previous explorers and the presence of significant mineralisation that has been commercially exploited historically or currently within the tenement areas themselves or on adjacent properties. Snowden recommends that MGA continues to develop a coherent exploration strategy for the projects. Snowden further considers that the reprocessing for gold of historic mine dumps in Victoria presents an obvious source of short-term cash flow and recommends that MGA devote appropriate resources to obtaining the necessary licences and metallurgical testwork to progress this. Snowden has completed the relevant section of Table 1 of the JORC Code and considers that the other sections are not relevant, due to the preliminary nature of the projects in question. The Competent Person for the Exploration Targets described in this CPR is Mr Jeremy Peters, FAusIMM CP (Min, Geo), a full-time employee of Snowden Mining Industry Consultants, of Perth, Western Australia. The status of Currawong’s projects is clearly explained in Section 4 of the Competent Person’s Report. Exploration by other parties on the projects in question is sketchy and this has been described in Sections 7, 8, 9 and 10 of the Competent Person’s Report. The geology of the projects has been described in in Sections 7, 8 and 10 of the Competent Person’s Report. Drilling by other parties is sketchy and this has been explained and described in Section 9 of the Competent Person’s Report. Data has not been aggregated and is reported as it appears in the source reports, with appropriate cautionary language. Not relevant, with consideration of data aggregation comments above. Snowden considers that the diagrams adequately illustrate the concepts presented in the text. Snowden has included suitable cautionary language at appropriate locations in the Competent Person’s Report. Snowden has appropriately referenced sources of data and opinions. Snowden has made recommendations for further work in Section 14of the Competent Person’s Report. A physical or chemical change to original rock minerals. Sediment deposited by rivers and streams. A fold or fold system in geological strata in the form of an arch. An iron arsenic sulphide, FeAsS. A particular deep lead in the Avoca area; see definition of “deep lead” below. Fine-grained volcanic igneous rock composed primarily of plagioclase and pyroxene. A coarse-grained rock composed of broken, angular rock fragments in a fine-grained matrix. A type of mineral composed of various elements combined with carbon and oxygen in the form CO3. Buried auriferous river bed deposits that usually occur as gutters cut into the bedrock and are known as “deep leads”. Geological measurement - the angle at which bedding or a structure is inclined from the horizontal. A sheet like body of igneous rock which cuts across the bedding or structural planes of the host rock. Mineralisation produced by near surface hydrothermal fluids related to igneous activity; originally defined as having formed in the range 50-300°C. An Exploration Target is a statement or estimate of the exploration potential of a mineral deposit in a defined geological setting where the statement or estimate, quoted as a range of tonnes and a range of grade (or quality), relates to mineralisation for which there has been insufficient exploration to estimate a Mineral Resource. A fracture plane in the rock which may displace rock units. Zone or rock below a geological feature. The study of abundance of chemical elements in overburden or rock. Coarse-grained, felsic igneous plutonic rock composed primarily of feldspar, plagioclase and quartz. Zone or rock above a geological feature. The name given to any processes associated with igneous activity which involve heated or superheated water. Australasian Code for Reporting of Exploration Results, Mineral Resources and Ore Reserves. The omnibus term used for a range of mixtures of hydrated iron oxides and iron hydroxides. Mesothermal gold deposits are formed from hot water that precipitates gold under high temperatures and pressure, generally at great depths in the earth’s crust. Change in minerals and/or texture due to changes in temperature and pressure over geological time. This term is used almost exclusively for the introduction of ore minerals and gangue minerals into pre-existing rocks whether by veins, replacement, or in a disseminated fashion. An Ore Reserve is the economically mineable part of a Measured and/or Indicated Mineral Resource. It includes diluting materials and allowances for losses, which may occur when the material is mined or extracted and is defined by studies at Pre-Feasibility or Feasibility level as appropriate that include application of Modifying Factors. Such studies demonstrate that, at the time of reporting, extraction could reasonably be justified. A Mineral Resource is a concentration or occurrence of solid material of economic interest in or on the Earth’s crust in such form, grade (or quality), and quantity that there are reasonable prospects for eventual economic extraction. The location, quantity, grade (or quality), continuity and other geological characteristics of a Mineral Resource are known, estimated or interpreted from specific geological evidence and knowledge, including sampling. Mineral Resources are sub-divided, in order of increasing geological confidence, into Inferred, Indicated and Measured categories. A period of mountain building. Decomposition near surface by exposure to the atmosphere and water. Valuable minerals deposited during the original period or periods of mineralisation, as opposed to those deposited as a result of alteration or weathering. An iron sulphide mineral (FeS2). The mineral silicon dioxide (SiO2). Commonly percussive drilling method in which cuttings are raised to surface by a stream of compressed air inside the drill rods. Pertaining to rocks formed from particles of rock or minerals deposited from suspension in water, wind or ice. An alternation description term for fine grained white micas such as muscovite mica or paragonite mica. A fine grained sedimentary rock with graphite (carbon). Sometimes referred to as “black shale”. The process whereby silica is introduced into a non-siliceous rock either by the filling of pore spaces or by replacement of existing minerals. The geological period extended from 435 to 395 million years ago, a duration of 40 million years. A plane (up to tens of metres wide) along which ductile deformation (shearing) has occurred. Zone of soils that contain anomalous or above ordinary concentrations of an element. The direction of bearing of a bed or layer of rock in the horizontal plane. A type of mineral composed of metal or metals combined with sulphur. Where sulphide minerals are disseminated or dispersed throughout a rock. A basin shaped fold in which rock are younging upwards. Layered sedimentary or metamorphic rocks, especially their relative ages and correlation between different areas. Linear excavations typically used by geologists to expose rock beneath shallow overburden. The sedimentary deposit of a turbidity current, typically showing graded bedding and sedimentary structures on the undersides of the sandstones. A relatively thin (millimetres up to 10 m scale) sheet of quartz or other minerals which fill a fracture cutting across pre-existing rocks. The process by which rocks are broken down and decomposed by the action of wind, rain, changes in temperature, plants and bacteria.